Several types of weighted-automata models and formalisms to specify and verify constraints on accumulated weights have been studied in the past. 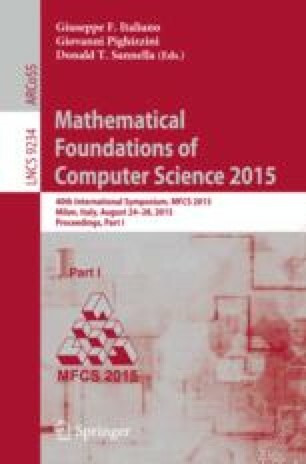 The lack of monotonicity for weight functions with positive and negative values as well as for ratios of the accumulated values of non-negative weight functions renders many verification problems to be undecidable or computationally hard. Our contribution comprises polynomial-time algorithms for computing ratio and weight quantiles in Markov chains, which provide optimal bounds guaranteed almost surely or with positive probability on, e.g., cost-utility ratios or the energy conversion efficiency. The authors are supported by the DFG through the collaborative research centre HAEC (SFB 912), the Excellence Initiative by the German Federal and State Governments (cluster of excellence cfAED and Institutional Strategy), the Graduiertenkolleg QuantLA (1763), Deutsche Telekom Stiftung, the EU-FP-7 grant MEALS (295261). We thank Stefan Kiefer for pointing us to the continued-fraction method and its application .